How does a revolt come about and what does it leave behind? What impact does it have on those who participate in it and those who simply watch it? Is the Greek revolt of December 2008 confined to the shores of the Mediterranean, or are there lessons we can bring to bear on social action around the globe? Revolt and Crisis in Greece: Between a Present Yet to Pass and a Future Still to Come is a collective attempt to grapple with these questions. 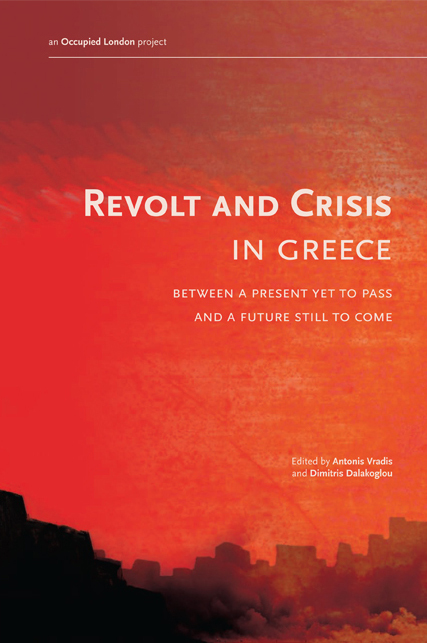 A collaboration between anarchist publishing collectives Occupied London and AK Press, this timely new volume traces Greece's long moment of transition from the revolt of 2008 to the economic crisis that followed. The book is an open question and a call to the global antagonist movement, and its allies around the world, to radically rethink and redefine our tactics in a rapidly changing landscape. Any way I can get a review copy of this for my blog? You would probably need to contact AK Press for that.